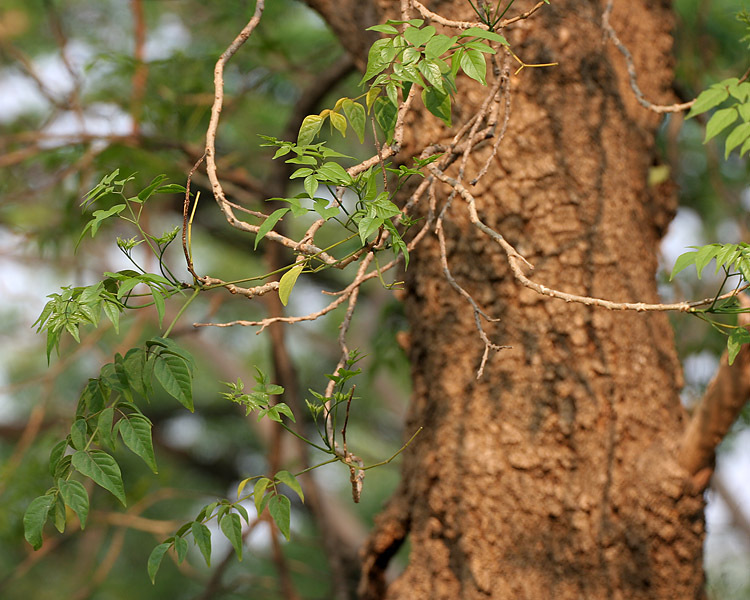 Share the post "Pleasant Fragrance of the Flowers Makes Indian Cork Tree Ideal For Garden"
Millingtonia hortensis, Tree Jasmine or Indian Cork Tree, the sole species in the genus Millingtonia, is a tree native to South Asia & South East Asia. The specific epithet ‘hortensia’ derives from ‘hortensis’ and ‘hortus’ which in Latin is related to garden. In its synonym, Bignonia suberosa, ‘suberosa’ derives from ‘suberos’ which means ‘corky’ in Latin. The tree is evergreen and grows to height of between 18 to 25 metres and has a spread of 7 to 11 metres. It reaches maturity between 6 to 8 years of age and lives for up to 40 years. The soft, yellowish-white wood is brittle and can break under strong gusts of wind. The leaf resembles that of the neem. From April until the rains and again in November and December, a profusion of silvery-white, delightfully fragrant flowers crown the foliage. Each flower is a tiny bell-shaped calyx, a long slender tube of palest green dividing into four waxy, white petals and several conspicuous yellow anthered stamens. Many flowers are delicately tinted with rose. The fruit is very long and narrow, pointed at both ends and contains thin flat seeds. 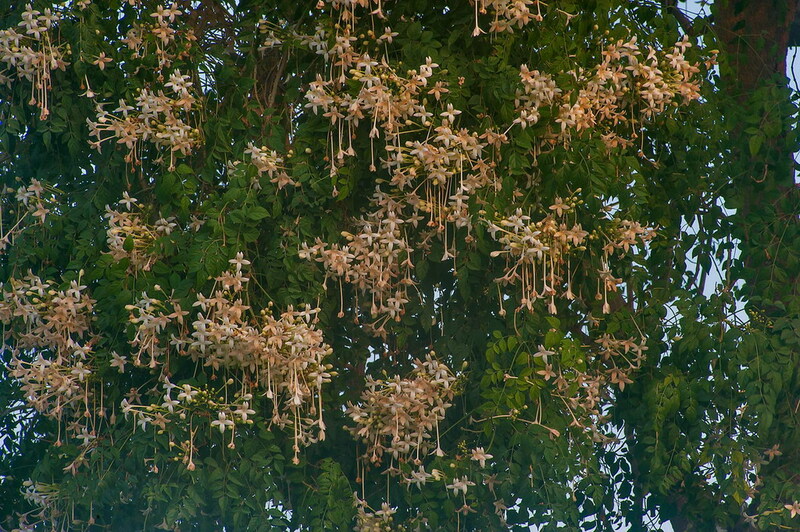 The long, fragrant flowers are commonly woven into an ornamental braid called Veni in Maharashtra, India. The tree is considered ornamental and the pleasant fragrance of the flowers makes it ideal as a garden tree. The wood is also used as timber and the bark is used as an inferior substitute for cork. The leaves are also used as a cheap substitute for tobacco in cigarettes. Millingtonia hortensis Linn. (Syn Biognonia suberosa Roxb., Biognonia azedachta Koen.) 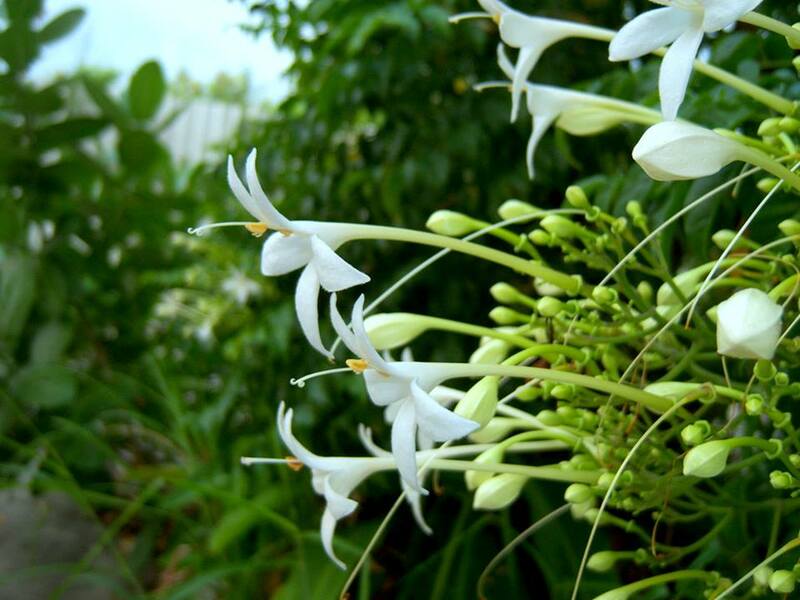 is an important medicinal plant in Southern Asia, ranging from India, Burma, Thailand and Southern China. The leaves of the plant are used as antipyretic, sinusitis, cholagogue and tonic in folklore medicine. They are an abundant resource of flavonoids, which might be beneficial in protecting liver tissue from injury. The leaves extract constituting mainly flavanoids, tannins and alkaloids showed significant activity against microbes causing candidosis. Polar extracts of the leaves of Millingtonia hortensis showed good antimicrobial activity, which can be compared with known antibiotics such as gentamycin and nystatin. Please note, all information on this website is for education purposes only. Consult a medical practitioner for any health problems or advice.